The installation of these new benches continues the Museum's efforts to introduce innovative art commissions at its recently opened facility. Photo: Richard Barnes. NEW YORK, NY.- The Museum of Arts and Design will unveil two specially commissioned black diabase benches by Swedish artists Ulla and Gustav Kraitz. Entitled Close Contact, the two benches, a gift of the Samuel J. and Ethel LeFrak Charitable Trust, will be unveiled on Tuesday, August 4th at 3:00pm at the Museum's front entrance at 2 Columbus Circle. The installation of these new benches continues the Museum's efforts to introduce innovative art commissions at its recently opened facility. "With the summer upon us, Ulla and Gustav Kraitz's artwork will provide a comfortable outdoor resting place after our visitors have enjoyed the Museum," states Holly Hotchner, the Nanette L. Laitman Museum Director. 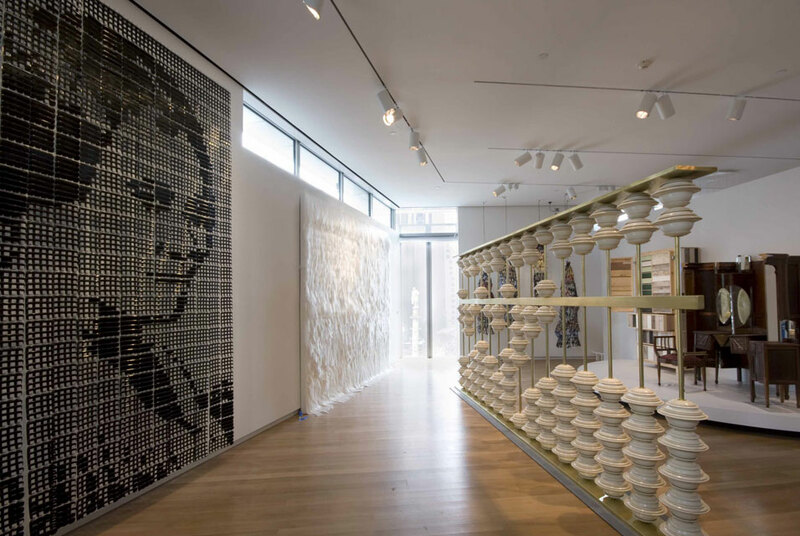 "The Museum focuses on contemporary creativity and craftsmanship and the ways in which artists and designers from around the world transform materials. Ulla and Gustav Kraitz are artists of international acclaim and we are honored to commission such masters in their field. Thanks to the generous gift of Samuel J. and Ethel LeFrak Charitable Trust, the benches will be a magnificent addition to the Museum's outstanding collection." "The Museum occupies an important place in the cultural world as it continues to expand its collection," says Ethel LeFrak. "We are proud to support the Museum's newest commission by artists Ulla and Gustav Kraitz. The Kraitz are true pioneers in their field and a perfect match with the Museum's mission which highlights creativity and craftsmanship, and celebrates the limitless potential of materials and techniques used by innovative artists. We trust that for years to come, visitors to Columbus Circle and the Museum of Arts and Design will be able to sit and contemplate the beauty and excitement of the city we love so much." Each bench is four feet in length and 17 3/4" wide and 17 3/4" high. Swedish diabase is a dense high-quality black stone. Ulla and Gustav Kraitz created their signature blue ceramic "eye" design inlaid on the front side of each bench. A second pair of benches, a gift by the Marcus Storch family, will be installed in the fall of 2009. Other recent Museum's installations include a painted trompe l'oeil installation by Mary Temple, First Week, a special commission by Benjamin Moore & Co; Ruth Duckworth's Untitled, 1991, an abstract ceramic wall relief installed at the lobby adjacent to the Museum's theater; El Anatsui's Soleme, a shimmering tapestry made entirely of foil from cast-off aluminum bottle tops and Olga de Amaral's wall hanging, Tierra y Oro #11. Installed in the Store and the Museum's foyer are two crystal chandeliers, Yves Behar's Mini Voyage and Tord Boontje's Blossoms, both originally designed for the Swarovski Crystal Palace. In the windows of the 3rd floor stairwells, the Museum showcases its splendid collection of goblets by makers including Dale Chihuly, Lino Tagliapietra, Beth Lipman and others, and on the 2nd floor stairwell Judith Schaechter's Seeing is Believing, a site-specific stained glass installation, is permanently installed. Ulla and Gustav Kraitz are one of Sweden's foremost artists sharing a prolific career of four decades. Their work has been exhibited widely throughout the world and can be seen in museums, parks, and public settings in Europe and the U.S. Most notable is their Hope Monument to famed humanitarian Raoul Wallenberg, which is installed in front of the United Nations Building in New York City.